Although this website has a dementia focus, the materials are well suited to many caregiving situations. • Why does he say he wants to go home when he already is? • Why is bathing such a challenge? • How can I be sure she isn’t eating moldy food? 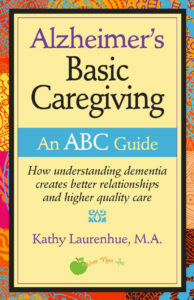 Alzheimer’s Basic Caregiving – an ABC Guide covers basic information on Alzheimer’s disease and other forms of dementia, patterns of progression, the logic behind behaviors and communication issues. 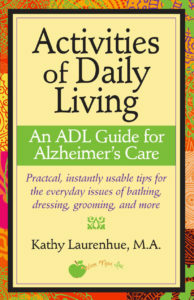 Activities of Daily living – an ADL Guide for Alzheimer’s Care focuses on bathing, dressing, grooming, continence care, nutrition and hydration. Is essentially saying, “I am uncomfortable where I am right now.” Home is where you can find food, drink, a bathroom, a comfortable chair and bed, peace and quiet, and people who love you. In seeking meaning, start from here. especially fixed shower heads raining down on them. They are also easily chilled, often modest, in pain and frightened by unwanted exposure. Begin by mitigating all that. Those with dementia may also lose their initiative and interest in cooking _ or even eating. If you want to be certain they eat nothing past its prime, you will need to be in charge of refrigerator cleaning and more. As an avid reader of Kathy’s newsletters, I am pleased to have her practical, often humorous and “make sense” approach return in her easy to read books. Her approach helped launch person-centered care and has endured the test of time. Your voice comes through so clearly and warmly that folks know that a real person with a sense of humor and vast creativity is at their elbow during their long journey… You are a light in the dark!